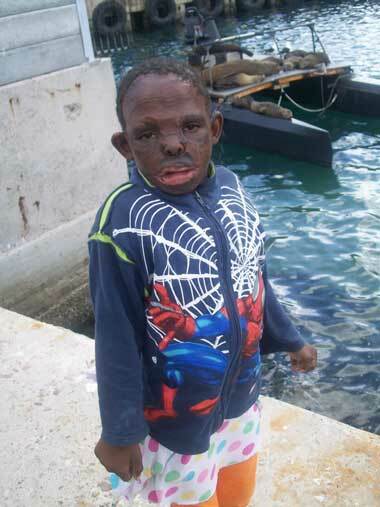 Zanele and Bongani were a hit at the Red Cross Children's Hospital in Cape Town in September 2010, when they arrived with toys, safety videos, and their own huge personalities. 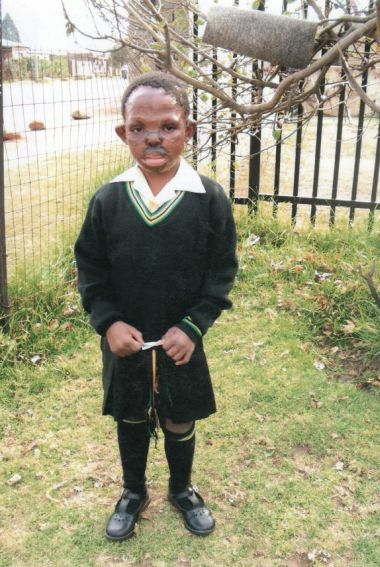 Zanele was due to have surgery in April 2010 to release her mouth contractures; and to have a dental procedure at the same time. It seems that she might have had access to food in the Chris Hani Baragwanath hospital ward and there were complications in the theatre, where she was being operated on by Dr Willem Erasmus. The anaesthesia tubes came out and there were food particles on the end of them. 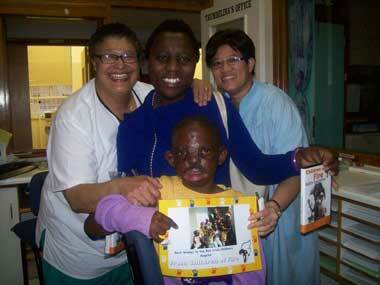 Zanele was taken to Intensive Care. She is not returning to Bara for surgery. Her teeth still need attention as well. 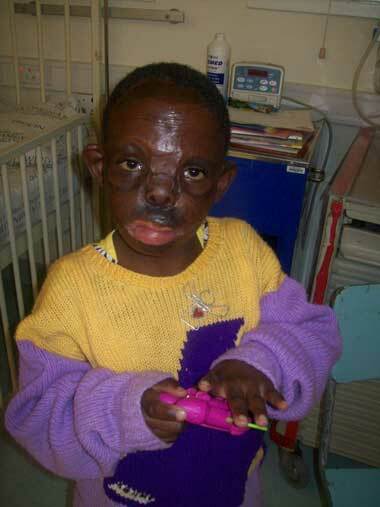 Little Zanele Jeza was seen by Prof. Sid Setzer at the University of the Witwatersrand Dental School on 17th October 2008. 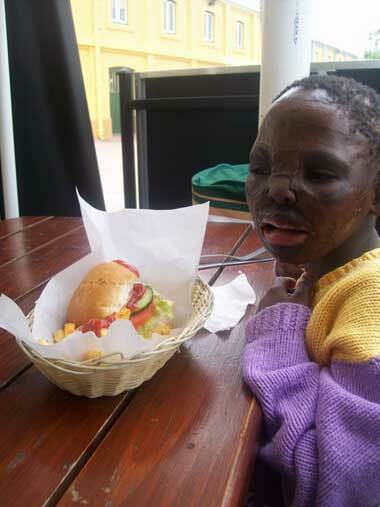 The hot polish burns survivor from Soweto cannot open her mouth properly for her teeth to be examined. The procedure will now take place under anaesthesia as a day patient in mid November 2008. Children of Fire appreciates the help it receives from a wide range of medical professionals in securing solutions for its children. She is pictured here with a pen in her mouth, showing the maximum opening that she can achieve. The mouth contracture typically means that it takes twice as long for her to eat a meal as the other children. Zanele Jeza was born on 18th September 2003. 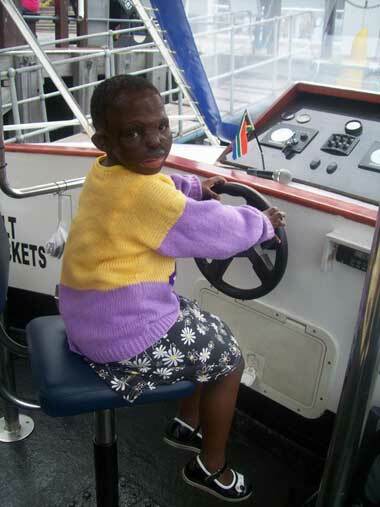 She is the sixth child of Mirriam Nombuyiselo Jeza (44) and of Bonga Patrick Jeza (42). They all live in a garage in Zola, Soweto. Zanele was born full term and had all her vaccinations but she has been consistently in the 3rd centile for weight or lower. Her eldest brother Thembinkosi is 24, followed by sister Jabulile (18), brother Lungisani (15), sister Tembisile (12) and sister Nolwazi (9). On July 3rd 2005 her mother was making floor polish from a combination of hot wax and paraffin. As she turned around to pour the pot of boiling liquid, her little daughter was suddenly in front of her and the hot mixture fell onto the 21 month-old toddler. 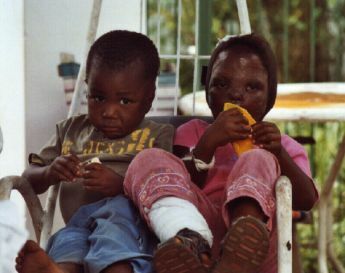 Her face and legs were badly burned but the trunk of her body, her neck and her hands are unscathed. 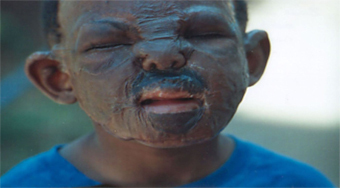 The hospital file erroneously states that Zanele pulled a kettle cord down resulting in hot water burns to her face. She was taken to Chris Hani Baragwanath Hospital and admitted at 17.02 hrs. There she remained for four long months until she was finally discharged on 7th November 2005, although the wounds were not completely healed. Topical antibiotics were used to treat the eye area and in late December 2005 she was referred to St John's Eye Hospital for persistent infection of the right eye. Zanele had problems with pulling of the lower eyelids on both sides due to her facial scarring but it was worse on the right. The corneas were ok though. 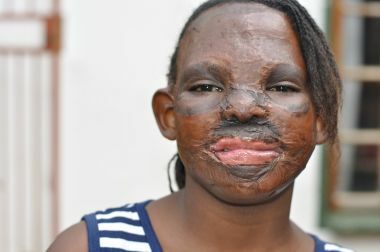 Zanele was sent to occupational therapy where they spent some three hours sewing her a face mask as a pressure garment. They also made a pressure garment for one leg. 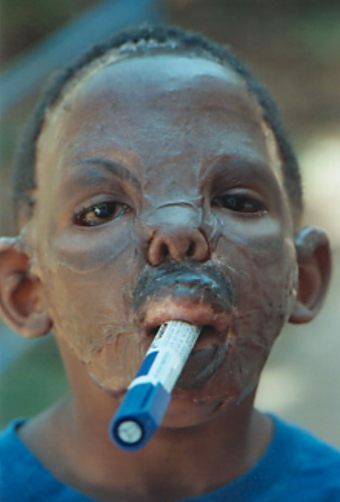 There has been very poor compliance from the parents and the little girl was unwilling in June 2006 to wear the mask at all and had lost the leg garment. Her face and leg scars were raised and keloids quite severe, even on a thigh skin donor site which does not bode well for future grafting. The use of Integra (artificial skin) would be good. The family did not keep pressure garment appointments as they were meant to. Zanele's father Patrick works as a chef but his wife Nombuyiso is unemployed. They are Zulu-speaking. 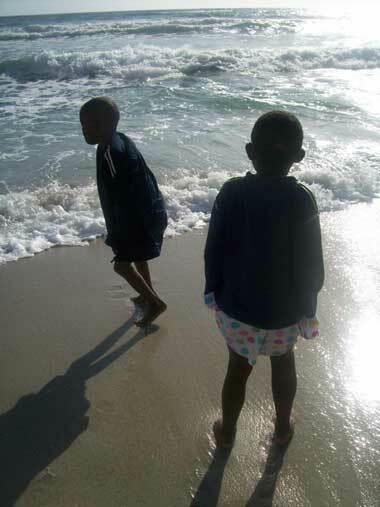 Most of Nombuyiso's siblings died and so her name translates as 'the return of borrowed goods' or something like God returning the lost siblings' spirit in the surviving child. 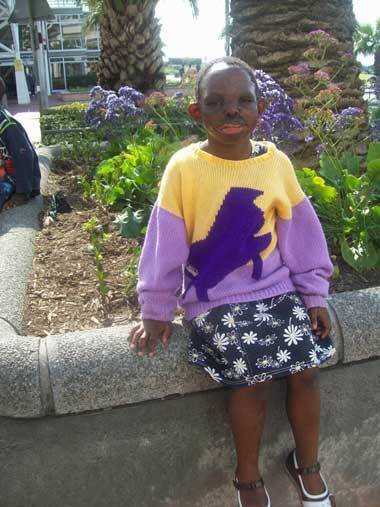 Zanele is sweet confident girl reaching reasonable developmental markers for her age. However she doesn't smile easily and when her father brought the facial pressure garment out of the bag, she cried. Her face is severely keloided and her nose will need to be rebuilt with cartilage at some stage in the future. Her receded hairline can be improved with tissue expansion. 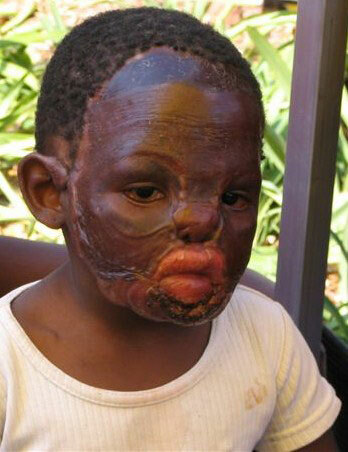 Zanele complains to her parents that the mask is itchy and that it hurts. She had not worn her mask for most of June 2006, possibly longer. There seemed to be some burn marks on the mother's hand/s as well. 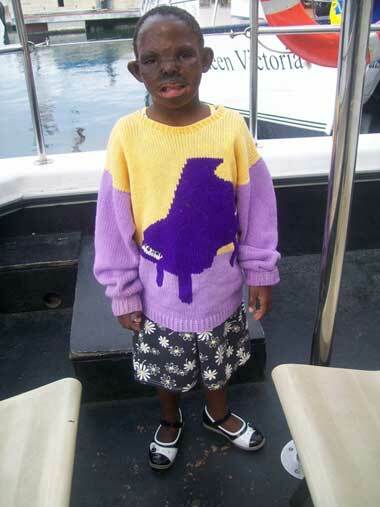 Zanele's parents will need to learn some 'tough love' to get her to wear pressure garments 24/7 except for washing. The garments are uncomfortable because they are working / 'doing a job'. They don't hurt but they are uncomfy and kids who wear them get teased. But they get teased more if they have lots of scars. 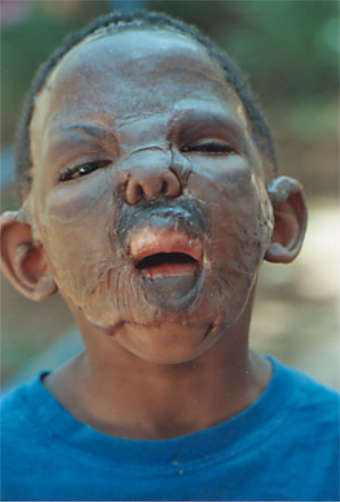 Pressure garments are most effective in the first two years after the burn. As there are five other children in the family, they would seem to be prime candidates for rehousing out of their garage home. The benefit of five siblings means 10 hands to massage aqueous cream into Zanele's scars, to try to prevent the contracture that is already beginning on her right inner knee. If each sibling could massage her scars for ten minutes a day - 50 minutes of massage could really help. Children of Fire gave Zanele a huge pot of aqueous cream, two lovely soft toys, a brand new padded waistcoat and a new soft winter hat. We put the face mask (pressure garment) on the new teddy and praised how handsome he looked. 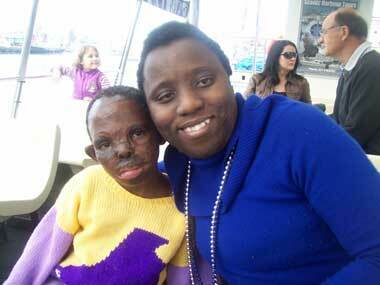 Nolwazi Mseleku, promotions manager of Jikelele i' Africa, is hoping to organise a fund-raising concert to benefit Zanele, to be held on July 9th 2006.